A new soup recipe to start your February off right! It’s a good day for soup today–as I write this it is a whopping -5 degrees outside with a windchill of -24 F. Yeah, that’s right: -24. But this hearty and spicy soup will warm you right up, and as an added bonus, it’s healthy too! 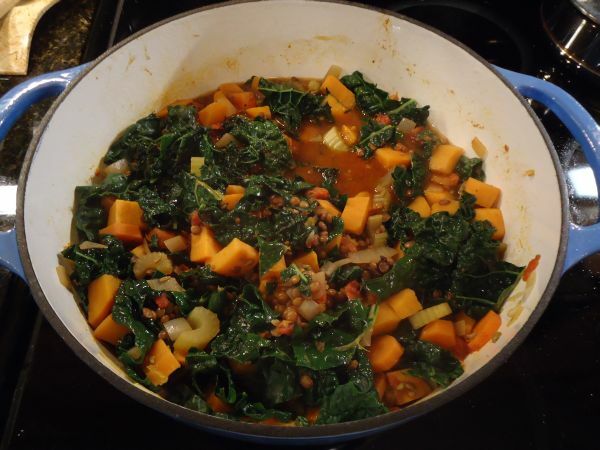 I actually didn’t originally intend for this soup to be a blog recipe–I came across Smitten Kitchen’s soup with lentils, sausage, chard and garlic while making my grocery list for the week, and had every intention of making it exactly according to the recipe. Since our household’s resident vegetarian was going to be out for the night, I was excited at the prospect of trying my hand at a recipe using meat. I figured I’d just make two pots, one with Italian sausage and one without so that my husband could share in the leftovers. When I got to the grocery store, I discovered that sweet potatoes were on sale. I like sweet potatoes, and I figured they’d go well with the Italian sausage, so I picked some up. Then I went looking for the sausage itself. The recipe called for sweet Italian sausage, which I found, but in my opinion Italian sausage should always be spicy. Alas, spicy Italian sausage was nowhere to be seen. Of course, I could just add my own spices after the fact, but I decided that if I was going to spice it myself anyways, I should buy something healthier. That was when I saw the package of ground chuck. It was three quarters of a pound–just the right amount given that I’d be the only one eating it. Perfect. At this point I was still intending to follow the recipe (just with the meat substitution and the addition of sweet potatoes), but I kept thinking about how big of a nuisance it would be to make two separate pots of soup (and how I didn’t really have two appropriately sized/shaped pots to do this), when finally the idea of doing meatballs popped into my brain. I could make spicy meatballs to put in the bottom of my bowl with the soup, leaving the leftover soup untainted by meat so that my husband could share in it later! So then I had to figure out how to make meatballs. Because I’d never done it before. 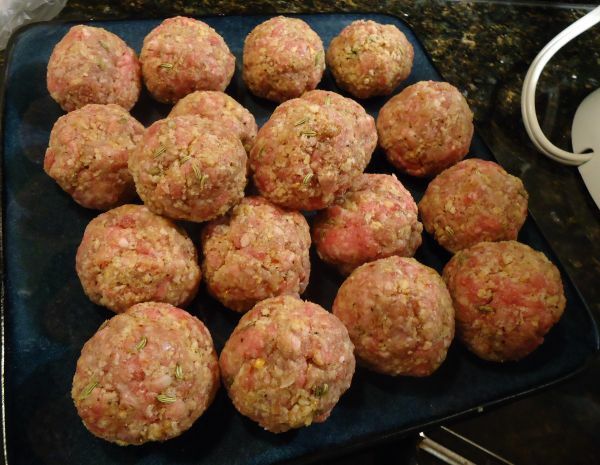 (Yeah, yeah, I know–I write a cooking blog and I’ve never even made meatballs. I’ve never made a steak either.) But how hard could it be? I figured I needed meat, breadcrumbs, and egg plus some spices, but I decided to consult Google just to be sure I wasn’t missing anything. As it turns out, most meatball recipes call for fresh breadcrumbs. From white bread. With the crusts cut off. Well, I didn’t actually have any white bread, crusts or no. I had a jar of panko breadcrumbs. And since it was freezing cold out, my car was covered in snow, and its door likely frozen shut, I decided to just go with it. In the end, panko worked just fine and the meatballs turned out to be juicy and flavorful. Since I decided to make meatballs, the soup was no longer going to have any contact with the meat, and thus was not going to get any of the flavors of it. So I needed to up the spice content. I decided to use the same spices I used in the meatballs (fennel seeds, smoked paprika, red pepper flakes, garlic powder, salt, and pepper) along with a star anise. 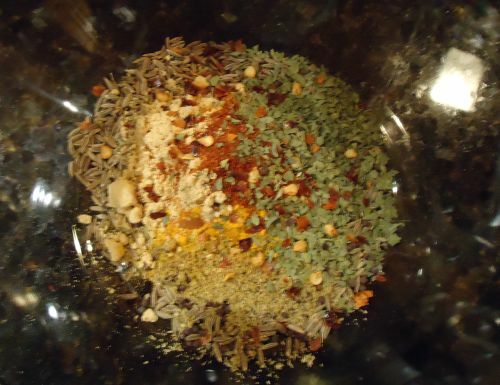 I also put this same combination of spices into the sauce for the meatballs. Heat the 3 tbsp of grapeseed oil in a large pot or dutch oven over medium heat. 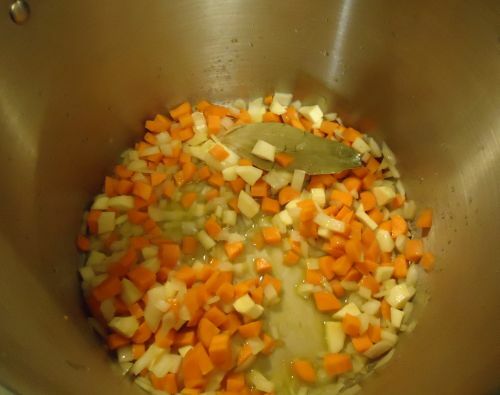 Add the fennel seeds and star anise for the soup, and stir them around for a minute or two until they start to get fragrant. 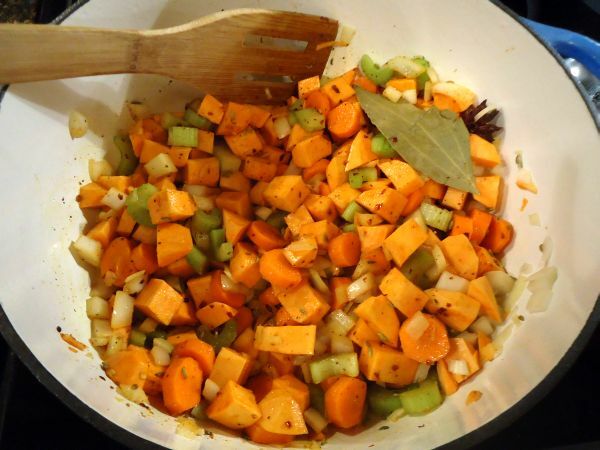 Add the celery, onion, carrots, sweet potato, and all of the spices except for the bay leaf. Cook the vegetables for a few minutes until the onions start to get translucent. Then add the water, tomatoes, lentils, and bay leaf. Stir, and then cover and simmer for 20 minutes. After 20 minutes have passed, check on your soup, give it a stir, and then cover it and set a timer for another 20 minutes. Combine the sauce ingredients in a pyrex measuring cup or other dish that pours easily. Set aside. 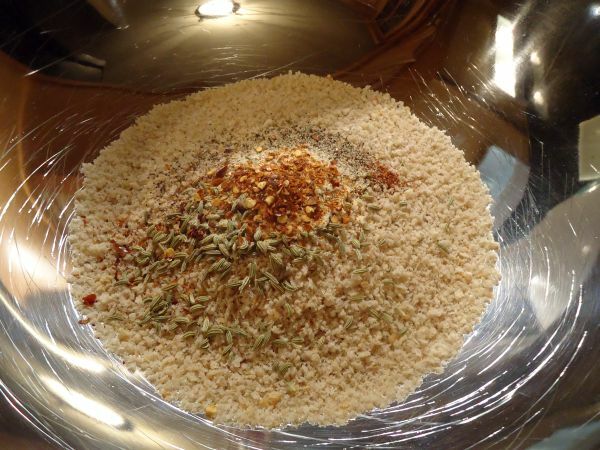 Meanwhile in a large metal bowl, mix together your breadcrumbs, spices, and the Parmesan cheese for the meatballs. Then add the ground chuck and beaten egg, and mix it with your hands until it’s just uniformly combined. Yes, you should really use your hands, and be careful not to overmix (you don’t want the meatballs to be tough!) Form the mixture into balls, about an inch and a quarter in diameter. I ended up with 18 of them. Add just enough grapeseed oil to just coat the bottom of a saute pan over medium high heat. 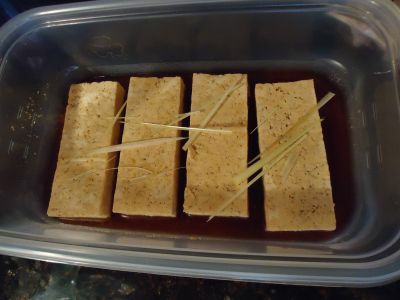 When the pan is hot (you can test this by gently setting one of your meatballs in it–if it sizzles, it’s hot enough), add all of your meatballs in a single layer, and use a pair of tongs to turn them occasionally until they’re browned on all sides. How do you know when it’s time to turn them? When they stop sticking to the bottom of the pan. Seriously, don’t worry if they stick at first–they’ll come unstuck. 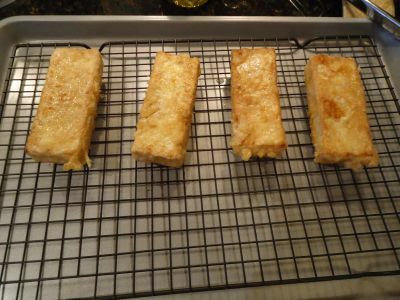 Once they’re browned on all sides, you can take the pan off the heat and skim out a bit of the excess oil if it seems like there’s a lot (do this quickly–you don’t want the pan to cool! ), and then deglaze the pan with your tomato sauce mixture. Be careful–it splashes. 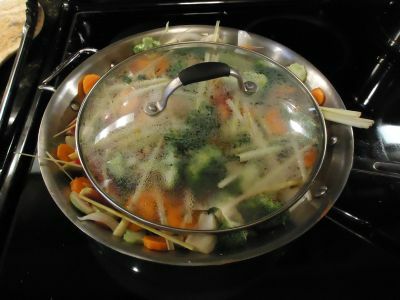 Reduce the heat to low, and cover the pan. Simmer for 10 minutes to cook the meatballs through. Meanwhile, your soup timer has probably gone off. Give the soup a taste, and check if the lentils are done. If they’re not, keep the soup simmering. Adjust seasonings as necessary, and then when the lentils are done, turn the soup down to low to keep it warm until the meatballs are ready. 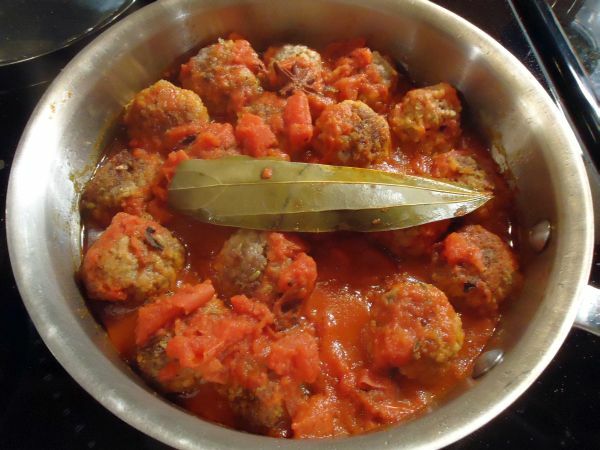 Check the internal temperature of the meatballs–you want to see at least 165 degrees. Make sure you check meatballs both in the middle of the pan and on the edges–mine cooked much faster on the edges of the pan than in the middle, so I ended up moving them around partway through. Once the meatballs are done, put three of them in the bottom of a bowl, cover it with soup, and enjoy! You guys, I’m so excited! The husband and I are headed off on our honeymoon tomorrow to Portland, Oregon for 10 days of food nerd awesomeness! We have both a spreadsheet and a customized google map marking out all the places we want to try–it’s going to be awesome! (Of course we also have lots of walking and hiking planned…have to do something to burn off all the ridiculous meals we’re going to be eating! Plus there are awesome waterfalls near Portland!) I’m planning on tweeting pictures of the food (and anything else cool that we come across! ), so if you haven’t followed me on Twitter yet, please do! Or not if Twitter’s not your thing–don’t worry, I’m planning a round-up blog post about the trip when we get back. And now on to today’s recipe! I made this a couple weeks ago but I hadn’t gotten around to actually writing up the post yet. 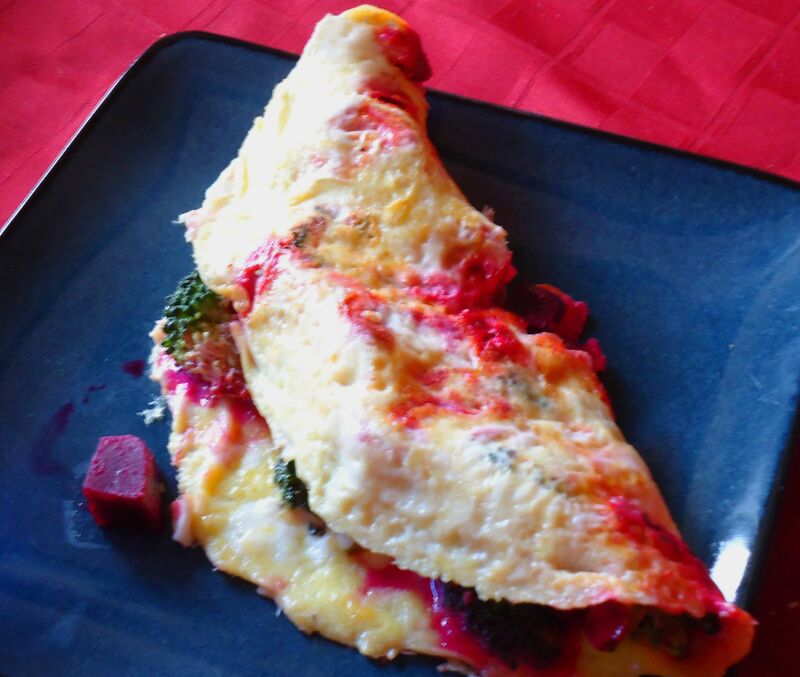 But this might just be one of my favorite recipes I’ve shared here. It has just the right balance of flavors…sweet/sour/savory/salty/bitter, with just the right amount of spice. The key is really the lime juice at the end. The lime juice takes what would have been a pretty decent dish to a whole other level of flavor. So don’t leave it out! Added bonus: this dish is ridiculously healthy, what with the quinoa and the beans and the kale and such. But it doesn’t *taste* like health food. It just tastes good. Rinse and pick over the quinoa, then put it, the water, and the tamari into a pan over medium-high heat and bring to a boil. 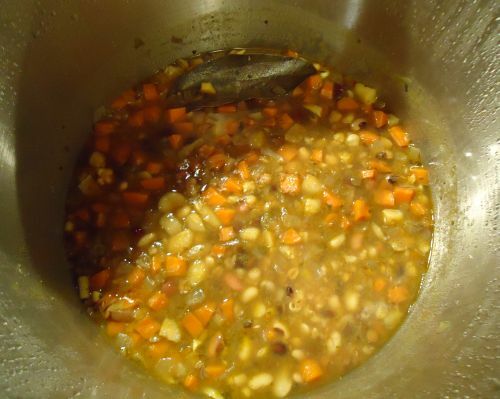 Once it starts to boil, reduce the heat and simmer for about half an hour until all of the water is absorbed. Keep an eye on it, both so it doesn’t boil over and so it doesn’t overcook. If it finishes cooking before you’re done with everything else, take it off the heat, fluff it with a fork so it doesn’t stick and then set it aside. Meanwhile in your largest skillet, heat the tablespoon of olive oil over medium heat. When it’s hot, add the onion, carrot, daikon, ginger, and black pepper. Stir periodically. When the onion starts to get transparent, deglaze the pan with the mirin and add the kale and habanero. When the kale starts to wilt, add the quinoa, green pepper, and adzuki beans. Mix well. 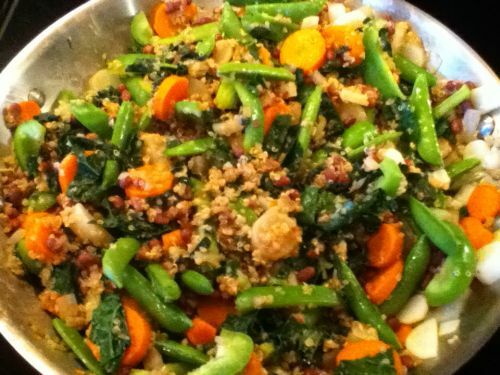 When everything is heated through, remove it from the heat and add the sugar snap peas and a splash of tamari. 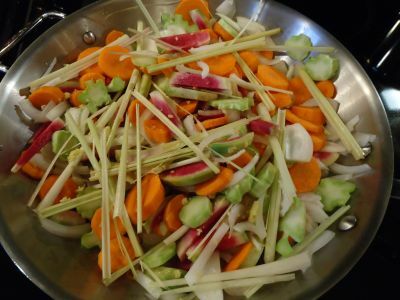 Pour in the lime juice, give everything a good toss to mix it all together and enjoy! And just like that a month goes by and it’s April. Apologies again for the lack of posts–especially after I had promised you all new posts! I do have one dish that I made during that week after my last post that I’ll write about later (it was a Thai-inspired curry dish), but it’s a new month and for now I’d rather write about something new! I went to the grocery store this week at about quarter after 9 on Tuesday morning. On the one hand, this is an utterly ideal time to go to the grocery store because (at least by this store’s standards), it is empty. No fighting people to get your cart through the aisles…heck, there are actually carts available! The downside, though, is that clearly their shipments of produce must arrive on Wednesday or Thursday because there was not a whole lot to choose from, and a lot of what was there was pretty sad. I quickly had to scrap plans to get some kale, or my second choice of spinach. I did find the last good bunch of big organic beets, so I do have beet greens to work with, and then I found some watercress. I’ve never bought watercress before. I’ve had it a few times, mostly in foreign countries. But it was one of the few greens they had that weren’t completely wilted and pathetic looking. So I decided on the spur of the moment that I was going to make a watercress salad. Which is weird for me since normally I don’t consider salads to be meals. But I’ve had this for dinner the past two nights and it’s actually turned out to be quite good and filling. But what else to put with the watercress? I had bought pancetta for another recipe (I’m on a bit of a Jamie Oliver kick lately–more on that later), so that was definitely going to go in there. I also wanted something sweet, but there’s not much in season right now in the fruit department (and the stuff from Chile is all coated in a thick layer of wax that’s impossible to remove! ), so I decided to grate up a carrot, which worked out nicely. I also added a couple green onions, just to get another flavor in there, and to tie it all together I made a dressing with lemon zest, lemon juice, olive oil, salt and pepper. Finally, I topped the salad off with some grated Parmesan cheese. All in all? Definitely a recipe worth repeating! 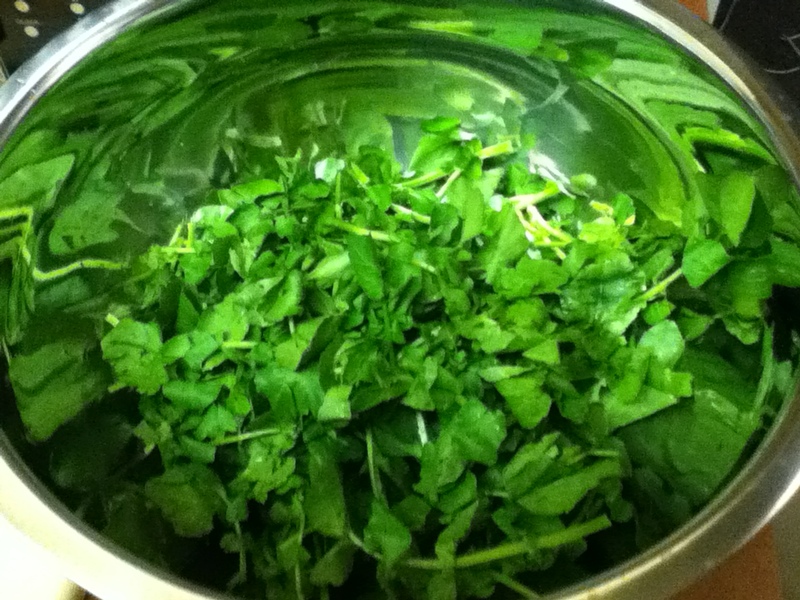 Wash and pick over the watercress, throwing away any bad leaves, tear it into bite sized pieces, and put it in a big bowl. 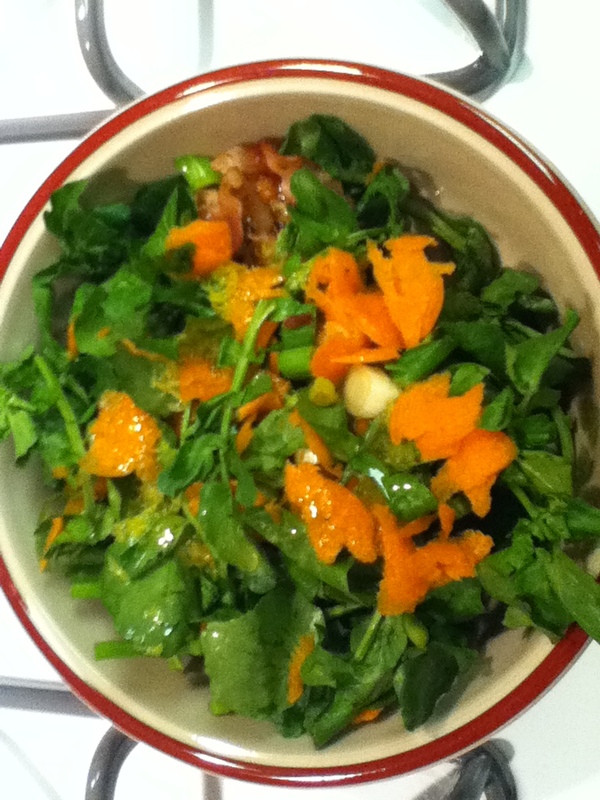 Grate the carrot and add it to the bowl with the watercress. Chop the onions and do the same. 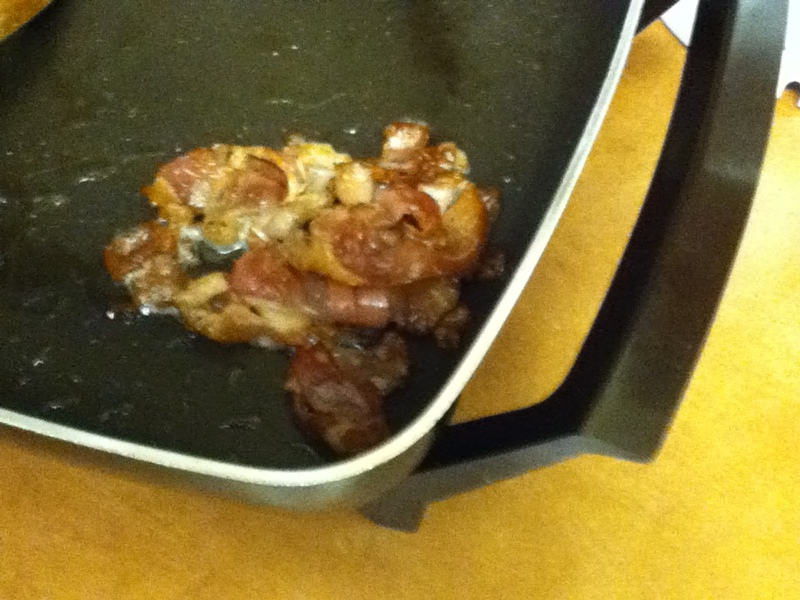 Cook the pancetta in a nonstick pan until nicely golden and crispy. Tear it up and add it to the bowl. 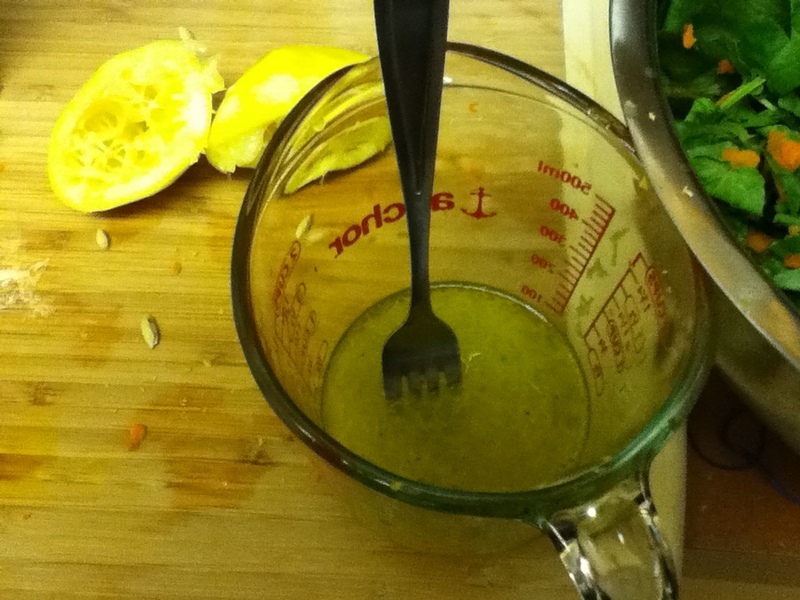 To make the dressing, zest the lemon using a grater or microplane*. Only get the yellow part of the zest–not the white part. Put the zest in a bowl or 2 cup measure. Cut the lemon in half and squeeze the juice in with the zest, being careful not to lose any seeds. Add the olive oil, salt, and pepper and whisk it all together. When you’re ready to eat, drizzle the dressing over the salad and top with a good amount of Parmesan cheese. *Be VERY careful to keep your thumb away from the microplane. Seriously.